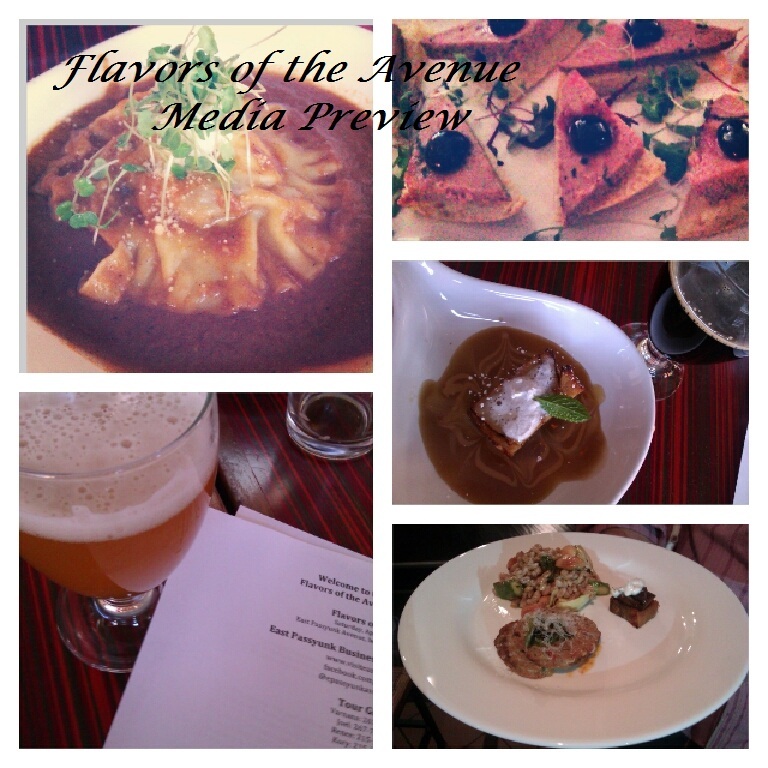 Yesterday I had the pleasure of having a preview tour of Flavors of the Avenue. 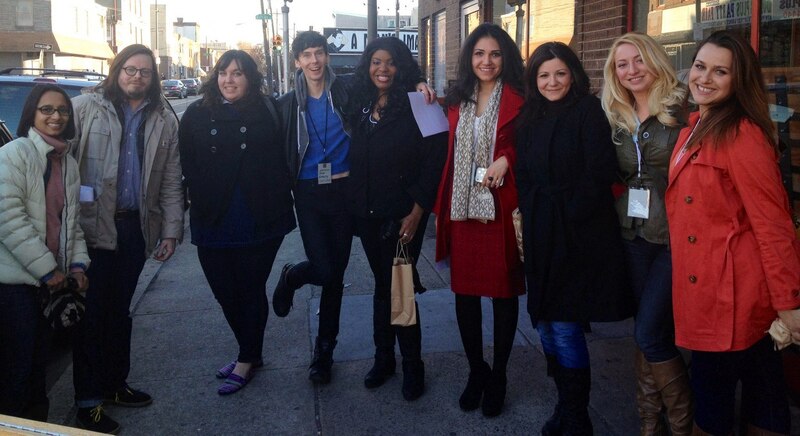 This was a guided tour to some of East Passyunk, Pennsylvania’s best restaurants. I have to say I will definitely be returning to East Passyunk especially in the summer months. Flavors of the Avenue is a festival in Philadelphia that I really think should not be missed its April 27th. I can still taste some of those delicious dishes. Every restaurant that we had on our tour were super friendly. The first stop was Birra which has a great selection of beer and their pizzas looked outstanding. We were served a Braised short rib Ravioli. The pasta was perfectly cooked, the meat melted in your mouth, and the sauce I just wish I had some bread to dip in it so it wouldn’t go to waste. The beer pairing with this dish was a Dogfish Head My Antonia. It had a nice crisp taste to it and complimented it very well. The dessert was a Whiskey Bread Pudding. All I can say is OMG this was sooo delicious. The pairing was a nice Founders Breakfast Stout, which had a nice coffee and chocolate taste to it. Second stop Paradiso, which I really enjoyed especially the staff super friendly and I had the pleasure of meeting the owner. They served a wild boar terrine crostini, which was a pate topped with a cherry. The sweet and savory really worked well. The pairing here was a Prosecco, Elderberry & Ginger cocktail which was light and refreshing. Third stop Cantina los Caballitos for some yummy mexican food. 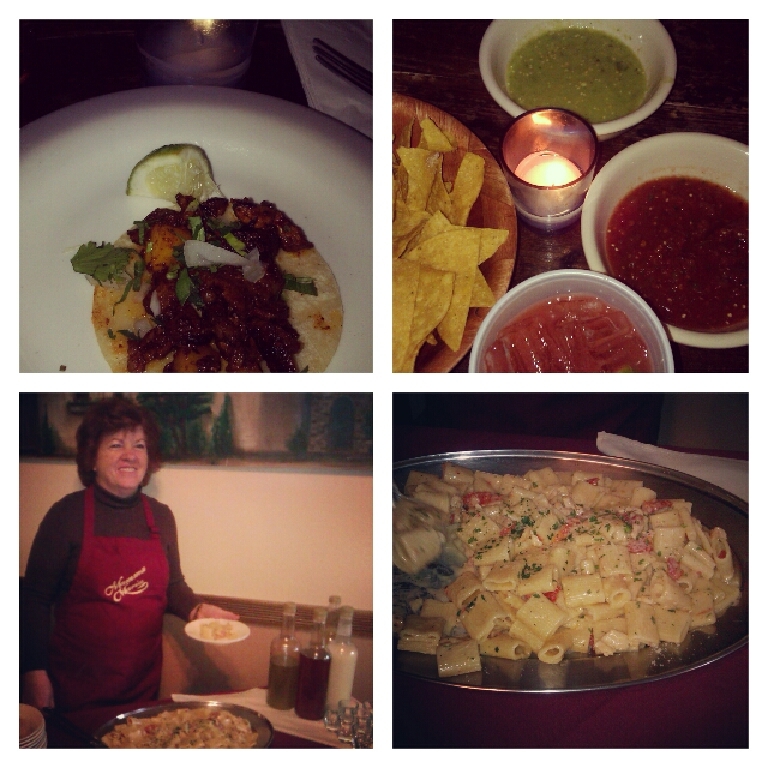 I am a big fan of mexican food and this place really was a fun place to hangout. Here we enjoyed Tacos al Pastor with a nice tender pulled pork and a pineapple salsa. This went well with the Blood Orange Margarita I am a big fan of those. Fourth stop Mamma Maria’s Ristorante, I felt like I was at home. We had the pleasure of meeting Mamma Maria and she reminded me of my grandmother. Loving, sweet and wanting you to keep eating and drinking. She served us with a beautiful pasta dish that I thought was outstanding it was Rigatoni a la Mamma, which was a creamy chicken pasta with sun-dried tomatoes, topped with parmesan cheese and parsley. The pairing was one of my favorites, homemade Limoncello that Mamma makes herself. If you love italian food and live in Philadelphia or are planning on visiting I recommend stopping in here. Fifth stop Plenty. This comfy little coffee shop has so much to offer from great salads to amazing sandwiches. Spanish meatballs, which are usually served as a sandwich. This meatball had some serious flavor going on delish. Instanbul eggplant is another great sandwich. It had some Middle Eastern spices going on it was topped with mushrooms, onions and a sauce called Cacik, a Turkish tzatziki. The side salad was a Farro, asparagus, artichoke and marcona almonds. This salad really kept you wanting more. The crunch really made the salad stand out from your typical. Sixth stop was Lucky 13 it was a cool little pub with wings that were out of this world. They had an Asian sauce and were perfectly crispy, which is a plus in my book. On the side was a nice refresh baby green salad, paired with a nice bourbon drink. Last on the list was Ms. Goody Cupcakes. I have a sweet tooth and I thought these cupcakes really knew where to hit the stop with some cool names like Yo Adrian and Pretty in Pink. There are 12 varieties on a day to day basis to choose from. The one that we got to try were Take me out to the ballpark; perfect for baseball season. It was a chocolate, beer infused cupcake with peanut butter buttercream, chocolate ganache and peanuts. I mean could you ask for more? I just want to tip my hat to all those involved in planning this out what a great job very well-organized.